ARLINGTON, VA; DECEMBER 12, 2018 – VICTORIA & ALBERT: THE WEDDING, a new two-part series hosted by popular Royal historian Lucy Worsley, premieres Sundays, January 13 and 20, 2019, 10:00-11:00 p.m. (check local listings) on PBS. 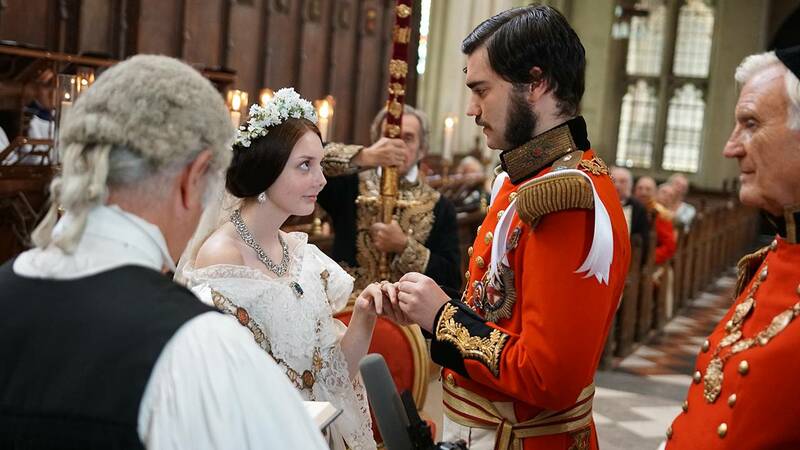 A BBC Studios production for PBS, this entertaining series provides an insider’s look into the elaborate planning that went into one of the most famous weddings of all time: the romantic 1840 union of Queen Victoria and her consort Prince Albert. With the help of a team of experts, Lucy oversees the meticulous recreation of the most important elements of the wedding celebration, scouring history books, archives, newspapers and even Victoria’s own diaries for details. The perfect accompaniment to the latest season of MASTERPIECE’s hit series “Victoria,” VICTORIA & ALBERT: THE WEDDING is a unique celebration of an enduring love that captured the imagination then and now — and a wedding that set the standard for generations of future brides everywhere. Lucy and her team are in their finery for Victoria and Albert’s big day. The ceremony is the culmination of the love story at the heart of this series, and the most accurate reconstruction of the event ever staged. It’s also the launching point for an examination of the feuds and political undercurrents that meant that this union had to be a fresh start for the monarchy, with a new kind of Royal family. The ceremony is followed by a sumptuous wedding breakfast prepared in a Georgian kitchen by food historian Annie Gray, a prelude to the first night that began a marriage so iconic it saved the Crown and heralded constitutional monarchy as we know it today. VICTORIA & ALBERT: THE WEDDING is written, produced and directed by Ian Denyer, edited by Alison Hunt and Helen Wickham, and executive produced by Jon Swain and Jack Bootle. Lucy Worsley began her career as a historic house curator at Milton Manor near Abingdon in the summer of 1995. From 1996 to 2002, she was an Inspector of Historic Buildings for English Heritage in the East Midlands region. In 2001 she was awarded a DPhil degree from the University of Sussex for a thesis on The Architectural Patronage of William Cavendish, first Duke of Newcastle, 1593–1676. The thesis was later developed into Worsley's book, Cavalier: A Tale of Chivalry, Passion and Great Houses. During 2002–2003, she was Major Projects and Research Manager for Glasgow Museums before becoming Chief Curator at Historic Royal Palaces, the independent charity responsible for maintaining the Tower of London, Hampton Court Palace, Kensington Palace State Apartments, the Banqueting House in Whitehall and Kew Palace in Kew Gardens. She oversaw the £12 million refurbishment of the Kensington Palace state apartments and gardens. In 2005 she was elected a senior research fellow at the Institute of Historical Research, University of London; she was also appointed visiting professor at Kingston University. Lucy is currently Chief Curator at Historic Royal Palaces. She is author of a number of history books and biographies; her most recent publication, Queen Victoria: Daughter, Wife, Mother, Widow, was in 2018. Lucy is a much-loved television presenter and was recently awarded an OBE in the Queen’s Birthday Honours List for services to history and heritage. VICTORIA & ALBERT: THE WEDDING is part of PBS’s regal lineup of royal programming featuring stories of the British monarchy. Kicking off on Sunday, January 13 at 9:00 p.m. ET, season 3 of “Victoria” on MASTERPIECE returns and finds the young Queen facing a crisis that threatens to end her reign. Continuing on Sunday, January 27 at 10:00 pm, historian Lucy Worsley snuggles up with Britain’s past monarchs to uncover the fascinating secrets hiding within some of the most secluded spaces in an encore presentation of TALES FROM THE ROYAL BEDCHAMBER. Finally, on Sunday, February 10 and 17, 10:00 p.m. ET, PBS presents a two-part series, MARGARET: THE REBEL PRINCESS, an intimate new biography of the trailblazing princess whose life and loves reflected the social and sexual revolution of her time.